We race down the runway. At the last second we are airborne. We climb and climb and climb. Then we bank into huge turns. At last we circle into "V" formations. We meet up with other C-47 planes, and then other planes meet up with us. The sky is full of planes. I look out the open door. We are still over England, and all I can say is, "What a sight! What a sight!" It has been said that we flew nine planes abreast and that we reached back for two hundred miles. We are told that four hundred ninety C-47 planes carried six thousand, six hundred paratroopers from the 101st Airborne Division alone. Besides our division, the U.S. 82nd Airborne Division and the British 6th Airborne Division were in the air that night. 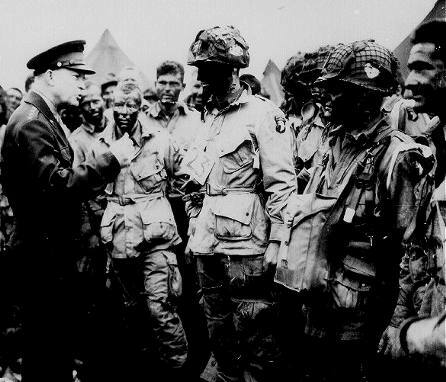 The total number of paratroopers to come down from the sky over Normandy some five hours before the start of D-day will be eighteen thousand, three hundred. The ships under us in the English channel were five thousand strong. Then there were fighter and bomber planes above us. It was a sight that man will never see again. To live to tell about it is a marvelous thing . . . Nothing was said or done by any of the men in the plane on that flight to Normandy. Once I sat back in my seat after looking out the door, I did not get up again. I did not sleep as some men did-or appeared to do. I did not talk to anyone, nor did anyone else talk. No one got sick, either. It was an uneventful flight. I remember saying a prayer to my God and asking Him to bless all of my people. I asked God to forgive me for what I was about to do to the Germans. And I was gracious enough to ask Him to have mercy on them, for I felt the average German did not know what he had done . . .